Travel Channel’s Dangerous Grounds with Todd Carmichael reviewed. That’s how the Travel Channel wants you to think of the host of Dangerous Grounds, its great new coffee-bean adventure show. Todd Carmichael holds the world record for the fastest unsupported trek to the South Pole, and two years ago he tried to become the first person to cross Death Valley unaided. He’s the perfect subject for a Travel Channel series—only Dangerous Grounds (Travel, premiering tonight, then Tuesdays at 9 p.m. ET) isn’t about Carmichael’s extraordinary feats of human endurance. Instead, it’s about the quest for a great cup of joe. At one point in the premiere, Carmichael’s cameraman asks him, “You sure this is smart, dude?” The answer is almost certainly “No,” since Carmichael’s search for an ancient strain of coffee in impoverished, corrupt Haiti sees the two of them narrowly escaping a riot in Port-au-Prince, driving treacherous country roads, eating chicken from an unrefrigerated roadside stand, and playing cat and mouse with gangsters who don’t want local growers making deals with outsiders. Carmichael is a man who knows what to do when his truck’s shock absorber pops out—he rips it off and resumes his journey on the narrow, winding road—and that it’s smart to disable a vehicle if you’re going to sleep underneath it. He can talk to all kinds of people—merchants, dirt-poor farmers, and dudes wielding machetes—without seeming intimidated or like a condescending douche. He’s also a savvy businessman, trying not to “act too jacked” so he can negotiate a good price when he comes across a crop of hand-picked, sun-dried, sustainably grown coffee beans. And because he goes to such lengths to deal directly with farmers, rather than the middlemen who exploit them, he doesn’t seem like an exploiter himself. Carmichael always seems to be in a hurry, and his restlessness lends the show a jolt of authenticity. He doesn’t give his endlessly patient cameraman time to set up shots; he’s out of the truck and running before the engine’s stopped, so viewers instinctively feel that the pig swimming in sewage wasn’t planted there and that the sweat darkening Carmichael’s T-shirt wasn’t sprayed on by a stylist. When he pulls out his portable lab to roast a handful of green beans, then lovingly grinds, brews, and tastes the coffee, his delight feels absolutely real. For the most part, Dangerous Grounds’ ports of call—Haiti, Bolivia, Borneo, Madagascar, Ethiopia, Cambodia, Papua New Guinea, and Colombia—aren’t tourist destinations. It’s a good reminder that the network that’s airing the show is the Travel Channel, not the Vacation Channel. Andy Singer, the network’s general manager, told me the audience wants “what they can’t find in the guidebook. They want what they can’t just look up online.” In these entrepreneur-worshiping times, we can probably add the frisson of seeing a cool dude make a business deal. Carmichael—tall, tattooed, and unpretentious—belongs to the same species as Anthony Bourdain, who will soon be departing the Travel Channel for CNN. Travel doesn’t call Todd Carmichael “the next Tony Bourdain,” but anyone who tunes in at 9 p.m. Monday, when the final episode of No Reservations leads in the 10 p.m. premiere of Dangerous Grounds, will see the similarities for themselves. The Travel Channel—like its Scripps stable mates the Food Network and the Cooking Channel, HGTV and the DIY Network—understands the value of a charming, charismatic host. The Travel Channel’s offerings aren’t exactly unique: The “driving around America buying people’s junk” show Toy Hunter is a specialist version of History’s hit American Pickers; Baggage Battles feels a lot like A&E’s Storage Wars; Hotel Impossible is cut from the same cloth as Fox’s Hotel Hell. It’s the talent that makes the difference. Jordan Hembrough’s goofy enthusiasm makes the dusty playthings he finds on Toy Hunter seem legitimately fascinating. And the Travel Channel’s advantage is that its hosts back up all that charm with expertise. Take Hotel Impossible’s Anthony Melchiorri. He “really is a hotel fixer; that’s what he does for a living,” Singer says. “We didn’t make that up, and there’s nobody better at it than him. Gordon Ramsey has a show about it, but that’s not his area of expertise. We speak with a level of authenticity and authority that only we can.” Todd Carmichael is the real deal, too. His company, La Colombe Torrefaction, is a $25-million-a-year business, and he’d be out on the trail of rare coffees whether or not a cameraman was along for the ride. My sole reservation about Dangerous Grounds lies in its title: Although Carmichael is clearly an advanced-level thrill-seeker, will he put himself in peril every single week? And if he does, will his version of reality eventually start to seem juiced? But perhaps that’s all part of the job. 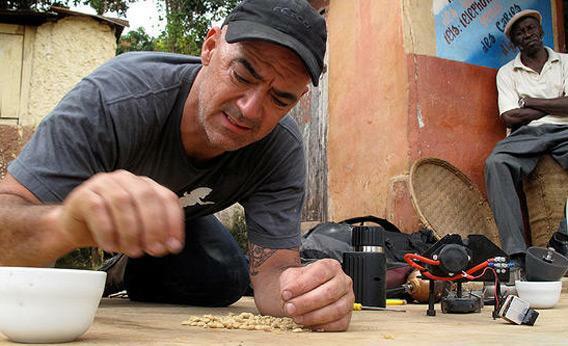 The best coffee grows in some of the world’s most dangerous places. That’s probably what attracted Todd Carmichael to the business in the first place.